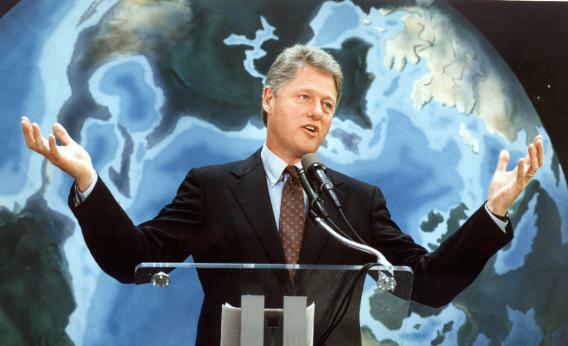 The battle for Bubba: are conservatives trying to co-opt Bill Clinton? Does the whole world want Clinton on its team? Republicans and Democrats alike are angling for his good opinion. Bill Clinton’s dance-steps nearer and farther away from Barack Obama, his words for and against Mitt Romney, have been endlessly scrutinized and spun on both sides of the political split in recent days. The former Democratic president favors broad economic stimuli and progressive social policy, so it stands to reason he should be a great champion of the current Democratic president. And that’s certainly the picture Clinton himself has tried to paint in a battery of reparative interviews, speeches, and public appearances following his flub on CNN, during which he referred to Romney as a “sterling” businessman. Yet Republicans are pointing hopefully at the original comment, trying to show that, in his heart of hearts, Clinton endorses their candidate. The pretense grew much harder to sustain after Clinton averred in no uncertain terms that a Romney White House would prove “calamitous for our country and the world.” Now it seems the conservative object is to unfold the inauthenticity of Clinton’s support for Obama. Enter Kathleen Parker, who yesterday snarked her way through a column about Obama and Clinton’s joint musical stylings at a fundraiser in New York City. The president she christened “crooner-in-chief.” The former POTUS on his saxophone became “his new sidekick,” “Dean Martin to Obama’s Frank Sinatra.” Parker suggests that Clinton’s support for the incumbent constitutes a politically expedient maneuver (an “act,” get it?) rather than a sincere vote of confidence. Clinton’s true goal, according to Parker, is “holding Hillary’s place” for another White House run in 2016. Parker does not go so far as to call Clinton a closet Romney fan, shrouding his small-government views for Hillary’s sake. Still, it seems curious to question whether his support for Obama is genuine. (Given that Romney’s the alternative, shouldn’t that be a foregone conclusion?) In a way, the notion that Clinton only likes Obama because he dreams of being First Husband dismisses Clinton’s political convictions, which align with Obama’s. By subtle implication, the strategy steers the former POTUS towards Camp Romney. Which raises a delicious question: Do Republicans hope to co-opt Bubba as one of their own? OK, probably not. More likely, they’re practicing the timeworn technique of turning the words of a supposed ally to their chief adversary against him. (See when the DNC released a super-cut of Huntsman bashing Romney). But we can infer that both the argument from authority and the cult of personality are alive and well in American politics. Even if Republicans don’t like Clinton, they recognize that his resume and charisma lend weight to his opinions. And maybe all former presidents bathe a bit in the glow of our collective nostalgia, especially during tough economic times. In any case, it’s fun to watch conservatives seeking approval for their candidate—or at least grist for the anti-Obama mill—from Bill Clinton, a staunch Democrat as well as a man the GOP did its best to disgrace in 1998.